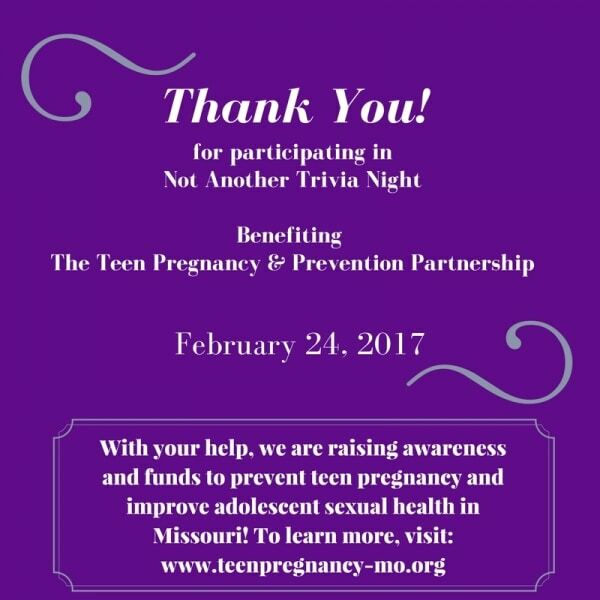 Thank you to everyone for your support in our second “non-event”, Not Another Trivia Night – Anniversary Edition. We appreciate your participation and donations in support of our mission. If you missed it, we hope you can join us next time! You can keep up with our events by following our social media pages: (www.facebook.com/TPPPMO) or Twitter (@TPPPMO). If you want to browse this year’s trivia questions, we’ve put them here for you or they are still posted our social media pages. Are you having trouble finding the answers? Don’t worry; there’s a link that directs you to the sources! What was the average price of one gallon of gas in the United States in 1997? Which iconic leader had more than 2 billion people across the world tune in to watch their funeral in 1997? After 146 years, which renowned news outlet published its first ever front-page color photograph? What was the Missouri teen birth rate in 1997? What was the Missouri teen birth rate in 2015? The U.S. Department of Health and Human Services Office of Adolescent Health (OAH) maintains a database of programs that have had an impact on behaviors that prevent teen pregnancy and meet criteria to be considered an HHS evidence-based program. In 2016, how many programs did OAH add to that list? Gustavo Gutierrez wrote a famous book outlining this form of social justice theology? Which group is credited with initiating movement to address the HIV/AIDS epidemic in the US? In what year were the National Sexuality Education Standards released? In what year did the HPV vaccine receive FDA approval? In a 1997 episode of their self-titled sitcom, what iconic TV star became the first person to publicly come out as gay on television? Which popular video game-turned-television show premiered in 1997, and returned to the pop culture zeitgeist in a new form last year? What record-breaking American Olympic athlete will be celebrating their 20th birthday on March 14th of this year? In June 1997, Bloomsbury Publishing released what novel by an unknown author that would go on to sell 107 million copies?